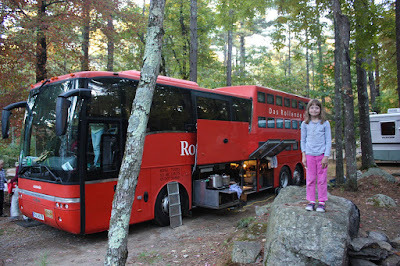 A couple of weeks ago﻿ at our campground in Massachusetts a large all red 45 foot tour bus pulled in beside us. 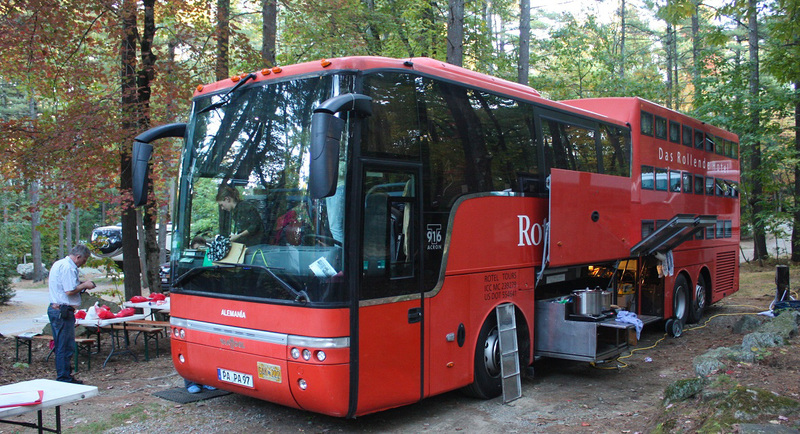 This behemoth is about as large as an RV can get legally. We are the same height and width as this big red bus but we are only 37 feet long. Two of us live comfortably in Phaeth. 24 live in the big red one! 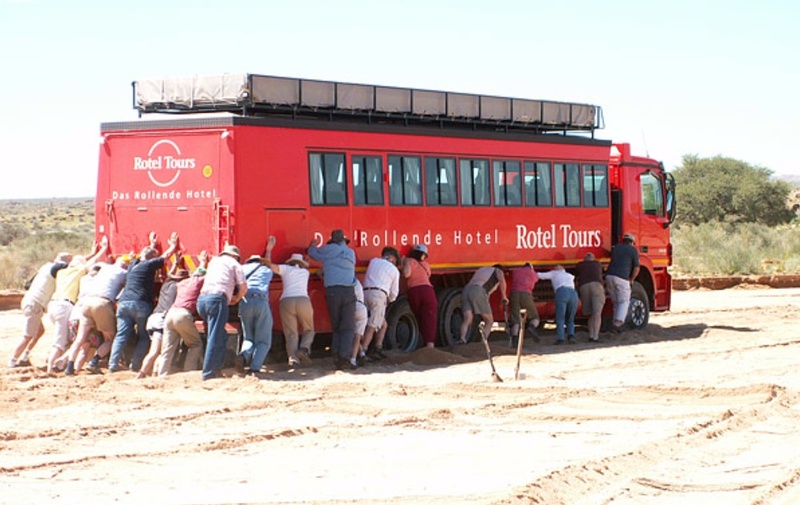 Rotel Tours is a German based tourism company that puts together adventures mostly for Europeans. These busses are modified existing vehicles to sleep and feed large groups. It has one lavatory and no shower so all 23 of the passengers were lined up at the campground facilities. "Guten Taq", my granddaughter Kaylee and I called out to the driver who was busy unfolding the kitchen from the side of the bus. "Huh? ", he answered. "I hope the rest of your conversation is in English because I'm from Alabama", he said. "All of my passengers are from Germany and know very little English which limits my having conversations with them." He looked tired but was happy to give us information about the bus and his job. Kaylee climbed a big rock to get a good view. We were told by the driver, who was American, that each window up in the back represented one traveler's bunk. Kaylee counted 23. The "basement" of this side of the vehicle opens up to reveal a big fold out kitchen where the meals of all the travelers are prepared. 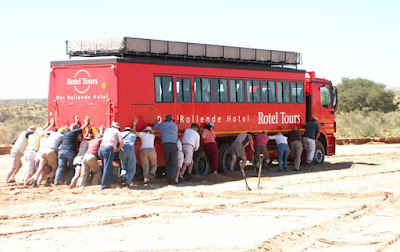 Each tourist has a job to do which makes the set up and clean up go rather smoothly. 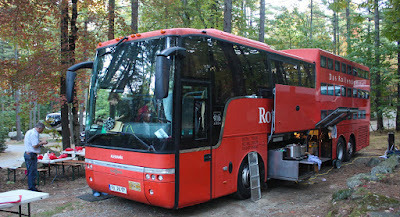 The bus had many folding tables from which the meal was served using plastic cups and paper plates. 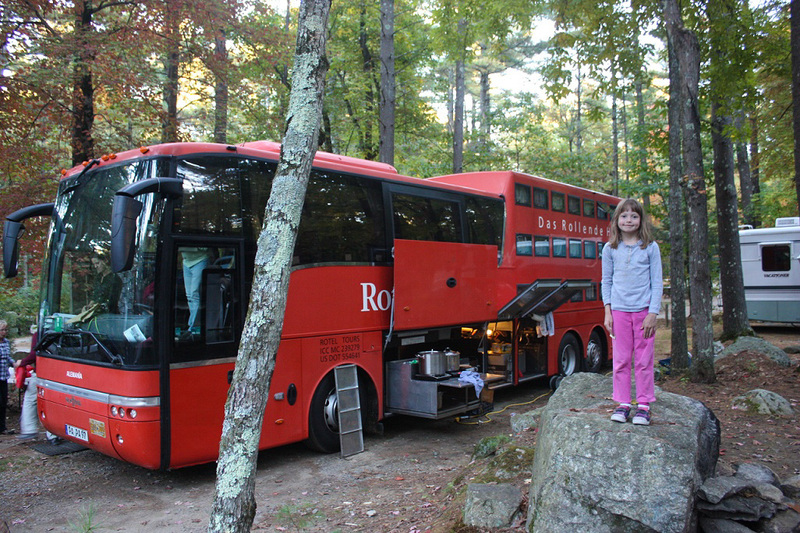 This is a marketing photo from Rotel's website showing the "spacious" bunk area. Here's another marketing photo showing the kind of adventure awaits you if you choose this travel style. So, if you like travelling and living real close to people, this could be a way to tour parts of the world. I guess Americans prefer a little more "elbow room". Oh my gosh, that is so interesting. We have traveled Ireland and then a few years later Scotland. Saw lots of RVs and all of them VERY SMALL. But of course they were so only one or two or three travelers.